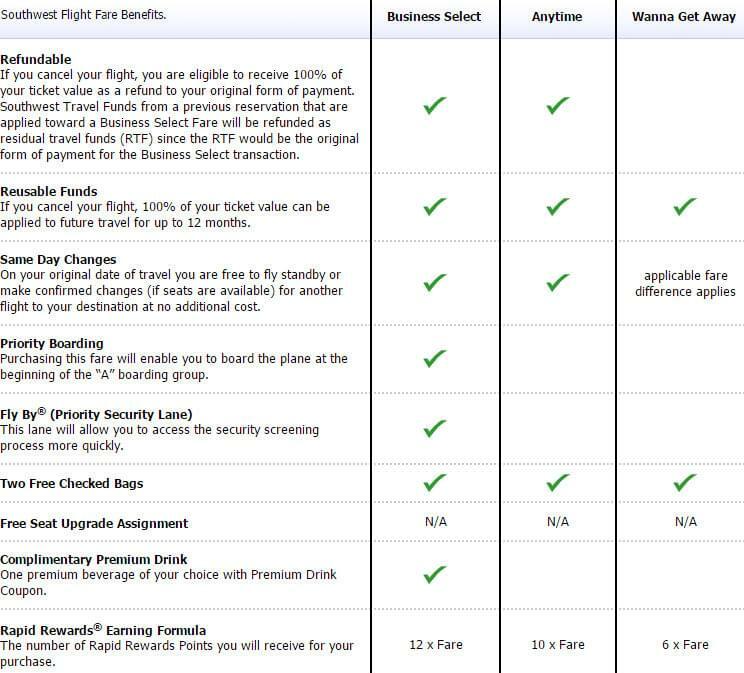 Who Is Southwest Rapid Rewards Good For? With its lack of seating assignments, checked bag charges, and change and cancellation fees, Southwest has never fit the mold of your average American airline. It’s gone even farther on its own path since its merger with AirTran. By getting rid of AirTrans Atlanta base, Southwest has confirmed its rejection of the usual hub-and-spoke system in favor of non-stop flights between regional cities. But as it has grown in the past few years, it has also added more service to major cities like New York and Chicago, turning it into formidable competition for the major domestic airlines. If you do a lot of domestic travel and value an airline that lets you rack up points quickly and gives perks just as quickly, Southwest could be a good fit for you. How Can You Use Southwest Rapid Rewards Points? Just as earning Rapid Rewards points is linked to the amount you spent on your ticket, spending them is linked to the cash price of the itinerary you’re looking to book. You can use Southwest Rapid Rewards points to book three different types of fares: Business Select, Anytime, and Wanna Get Away. Since Southwest doesn’t have separate first or business classes, the business select fare, which comes with some of the perks you’d usually get in upper class, is the closest you can get. 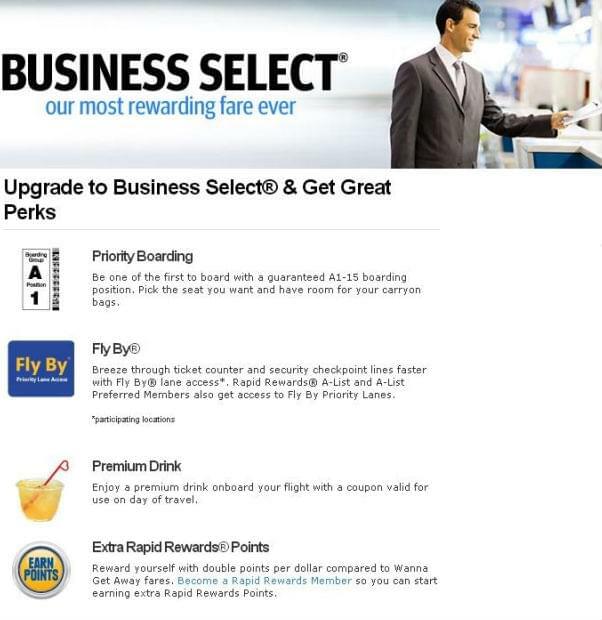 Business Select fares include priority boarding and a guaranteed seat in the front of the plane, priority securing screening, and a premium drink coupon. Anytime fares are your typical standard award, offering a high redemption rate just a touch below the Business Select fares. These awards are available as long as there are still seats available on the flight, though Business Select and Wanna Get Away awards are capped. The cheaper Wanna Get Away fares are changeable but not completely refundable. Due to its cash fare-based redemption system, there aren’t any particular routes or regions that give a better mile value than others. However, the different fare types do provide a dramatically different redemption value, beginning with around 1.4-1.8 cents per point value on the basic Wanna Get Away fare. These are not only the cheapest cash and award flights, but also the best value. The redemption rate declines rapidly as the perks of the fare improve, with the next level, Anytime fares, carrying a redemption rate around 1.1 cents per point. Despite the extra perks of the Business Select fare, it’s the worst value you’ll get when redeeming Rapid Reward points, clocking in around 0.9-1 cent per point. Due to the high point-earning potential of Business Select fares, if your need to purchase a fare in that category, it’s better to buy it in cash and earn the points if possible. As Southwest does not have a multi-class cabin, there is no separate seating area for business or first, but many of the amenities are included in the Business Select fare.After booking a trip, you can log into your Rapid Rewards account and upgrade Anytime fares to Business Select with a $15 to $25 co-pay depending on the length of the journey. Each subsequent level includes the perks of the previous level unless stated otherwise. An additional tier level, called companion pass, allows status members to designate a companion who can accompany them on any Southwest flight they take by just paying the taxes and fees on the second ticket. Southwest offers two flavors of credit cards the Rapid Rewards Premier Card and the Rapid Rewards Plus Card that are both available in business and personal versions. Both the Premier and Plus cards offer 25,000 bonus points after a $1,000 minimum spend, allow you to use your Rapid Reward points on additional non-airfare travel awards, and earn 2 points per dollar on Southwest and Rapid Rewards partner purchases and 1 point per dollar on all other purchases. The Premier card, which carriers a $99 annual fee, also gives cardholders 1,500 tier points per $10,000 spent on the card (up to 15,000 tier points annually, does not charge foreign transaction fees, and awards 6,000 points upon renewal. The Plus card awards a 3,000-point anniversary bonus.